Happy Year of the Rooster! Saturday, January 28 is the first day of the lunar new year and my family in Hong Kong will be celebrating with a lot of good eating. 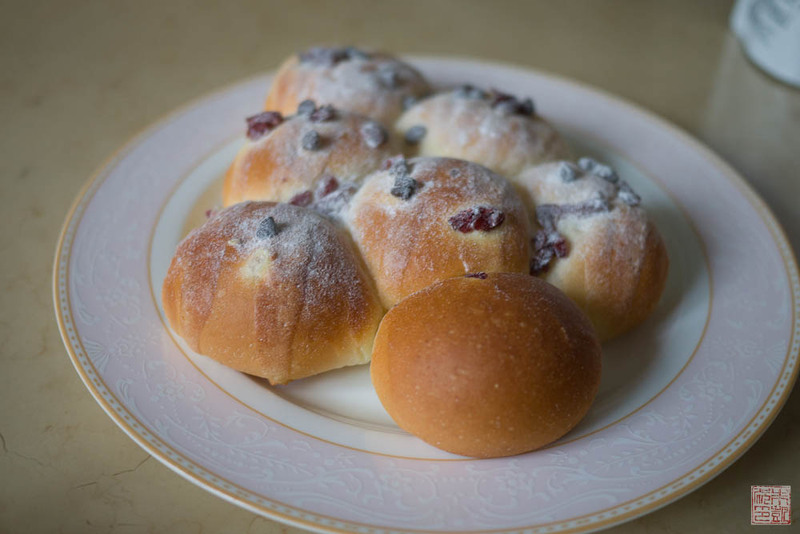 Although eating is pretty much the official pastime in Hong Kong, it’s never pursued more vigorously than at Chinese New Year, when every restaurant and eatery is packed to bursting with happy, reveling families. I’m doing my own bit of feasting back over in California: I was invited by Christine of Vermilion Roots to join in a virtual Chinese New Year party. I and twenty-six other bloggers made some sweet treats to celebrate the holiday, and to give you a peek into what we’re making in our homes for the festivities. 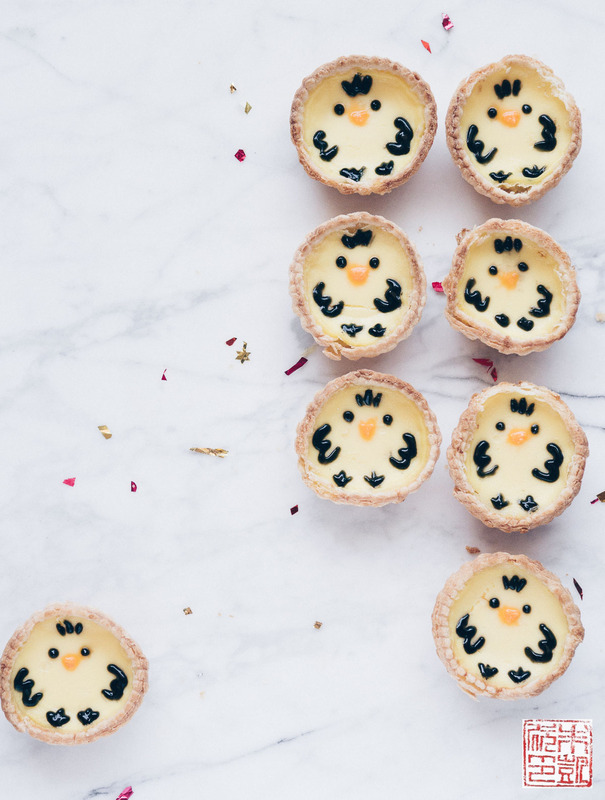 My contribution is a tribute to the Year of the Rooster: some egg custard tarts, or dan tat, decorate to look like chicks. I’ve been obsessed with #cutefood lately (partly because of my daughter, but I also have to admit because of me!) and this seemed like a perfect opportunity. 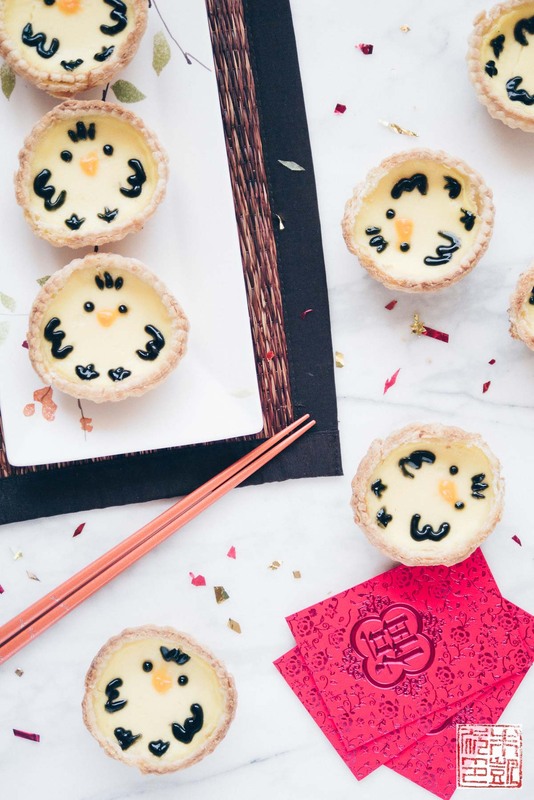 Although egg custard tarts are ubiquitous in Chinese bakeries, they aren’t difficult to make at home. This version features a pâte sucrée crust (simpler to make than the flaky puff pastry style) and a rich, just set custard. The most important key to a silky smooth custard is to strain the custard through a fine mesh sieve before filling the tarts, so make sure you don’t miss that! Once the tarts are baked and cooled, I used some melted chocolate and bit of orange icing to pipe on eyes, wings and feet. Almost too cute to eat! I love all of the creative and unique spins on traditional Chinese desserts. Happy Chinese New Year, and may the Year of the Rooster be a delicious one for you! Remove from oven and let cool a couple minutes before unmolding. Pipe chick faces and other decorations on the tarts with melted chocolate. 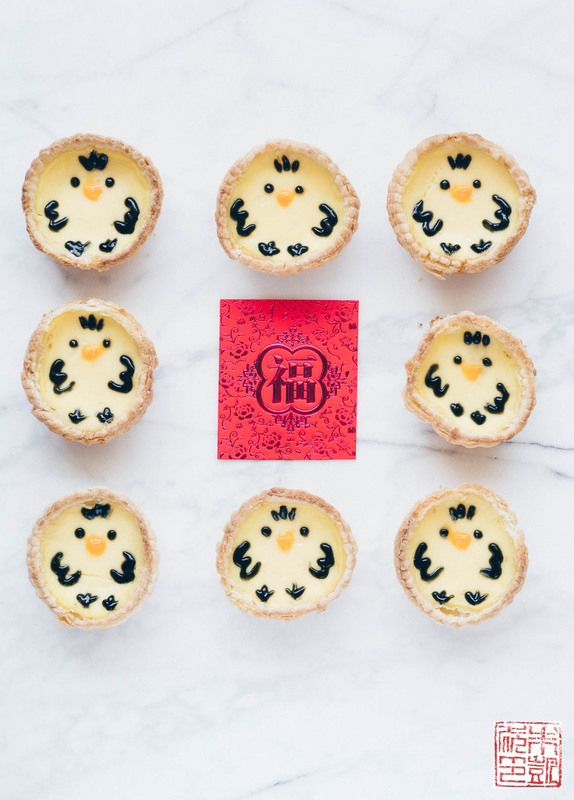 Anita, these are the cutest egg tarts I have ever seen! I want to decorate my house with them but they’ll probably be gone in no time because I have a weakness for egg tarts. Thank you for the good cheers! Oh my goodness! These are sooooo adorable!!! Cuteness overload!!! you are so creative! I’m loving this!!! these look adorable! and i have to heartily agree with your statement that the pate sucre/hk style dan tats are 349234x easier than their puff pastry/portuguese cousins, especially after my mishaps of trying to use storebought puff pastry and that ending with custard everywhere in the oven because it’s too aggressively poofy. Gong Xi Fa Cai Anita! 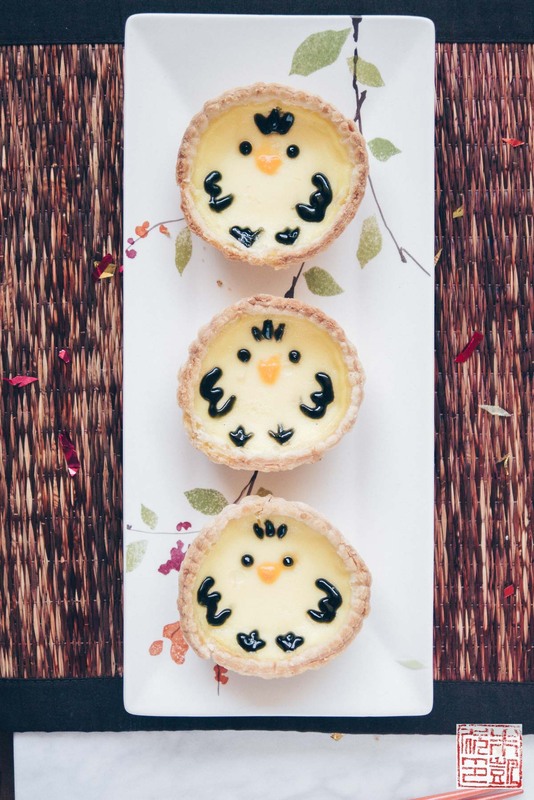 Haha, it is so weird that we have the same name 😉 I love egg tarts in general and yours look especially cute with the chick pattern, just the perfect thing to celebrate the year of the rooster. These are adorable! Happy lunar new year! Egg tarts are my favorite! That is the first thing I want to eat when I go back to Hong Kong. These are totally adorable! Happy Year of Rooster! That is such a cool idea! The little chicks are so cute too! I love dan tat but these are sooooooooo darling! I’m sure they are a hit where ever they go! Happy #sweetlunarnewyear!